« Which player who will play in Chelsea v Arsenal has scored 11 goals in his last 11 league starts? The Untold Banner is now on display at the Clock End. 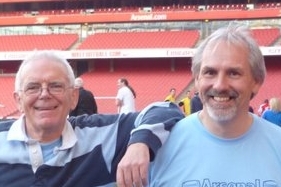 I must immediately thank Mark Brindle of Arsenal who encouraged and supported our efforts to bring this to fruition, and of course Blacksheep, who travels with me to Arsenal games, and whose idea this was. One day, in a desperate move to get me to shut up with whatever it was that was making me talk 20 to the dozen as we drove to a match, Blacksheep came up with this idea of an Untold Banner. I told him the club would never go for it, but he persevered, and now thanks to his perseverance and drive, it is there, at the stadium, expressing our support for the manager and his vision. And of course I must thank each and every person who so kindly contributed to the fund that paid for the creation of the banner plus most particularly at this juncture Jennie Bradley who did the design work for us, who I have (in a very remiss manner) failed to thank until now. Jennie, this is the sort of thing I do – I chatter about rubbish, and then forget the really important stuff. We really owe you for this. The Untold Banner is a brilliant idea, and I am absolutely delighted that we’ve done this all together. For everyone who can’t get to the stadium, we will try and get more pictures of the banner in situ, at the next home game. I think I might add today to the Anniversary Files. There is an article about the making of the banner and the list of people involved in the whole project on a page of its own, and we maintain a permanent link to this page. It just shows what can be done when you put your mind to it. The Untold Banner, and the permanent list of people involved. Great banner and congratulations to all who contributed. The only negative is that there is no indication as to its source, but I suppose the club doesn’t permit this. Well done and congratulations to everyone who contributed. It will surely be worth look out for this banner during the match. 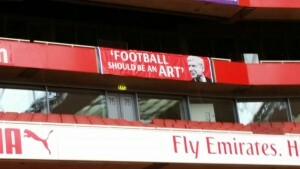 Seeing it now it sure brings these words together with Wenger: Football and Art. And that is what Wenger is all about in the end. Great design. From over here : great work Jennie! Very pleased to see the banner up – excellent news. Wenger= Van Eyck (Ghent Altarpiece). Mourinho= Tracey Emin (scabby bed). Well done all those who contributed to that. Total honesty- I was unsure about the choice at first. I imagined the way idiots would receive that message- ‘art,art!’; ‘that’s his problem- football’s about winning’, stuff of that ilk- but on reflection I think it’s a cracking choice. It’s the truth. Wenger is obviously desperate to win, but there are other strong forces at play with him, which, as we know, is pretty unusual. You celebrate that, and the manager, and you fight against idiots, so it’s a good choice with, I think, a touch of defiance to it which mirrors that of Wenger himself. Really wouldn’t rule out the banner catching the media’s eye and generating a bit of chat. 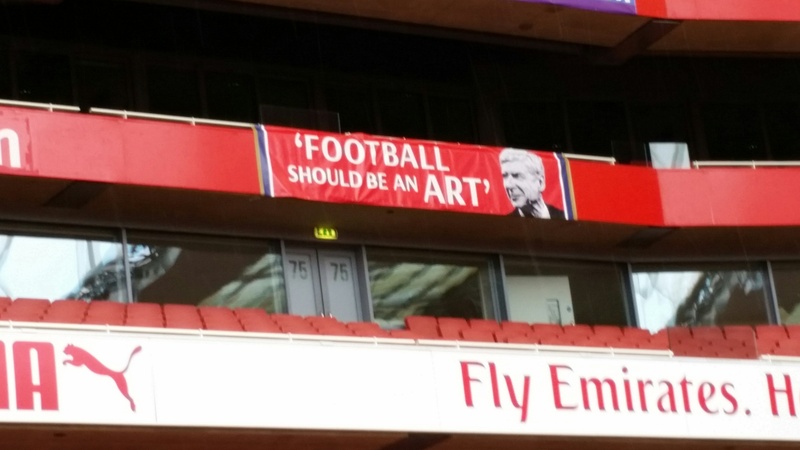 “Football is an art” the banner says….but so is extracting money from your club. Just read that Man Utd are paying 6 Glazer siblings £2.5m each annually (a total of £15m) under the heading of “administrative expenses”. If that doesn’t sound the warning bell to well-regulated clubs like Arsenal about the dangers of sugar daddy types, I don’t know what will. Great banner. Well done all. nicky – there was something about dividend to A class shareholders (83% of the club are A class all owned by the Glazers). There is a lot about this on some sites. Yeppeeeeeeeeeeeey! At last. Thanks to everyone involved in this. Congratulations to the Untold Arsenal family. By the way where are the sad souls? WOO HOO , HOO ! Well done , guys ! Untolders unite ! After seeing that banner I can remember another great quote by one famous Prince Poldi.. Excellent work all of you!!! @Tony What part of the ground have the put it up in? I sit in the Lower East stand, in the block next to the away support. @Nicky Re MAn Utd – I thought they were dividend payments to the Glaziers. They owe 80% of the shares between them. Real great that banner.glad its finally there and lots of thanks to the contributors. Love the tab icon with the Banner photo! Good job guys. Now about the “Mike Dean is a ****” banner idea …. Now Tony can we have a huge banner (same content) that drops from the roof before the game opposite of the dugout on 23/01/2016.